This shrub features delicate variegated cream leaves during the growing season and blood red stems on display in the winter snow. 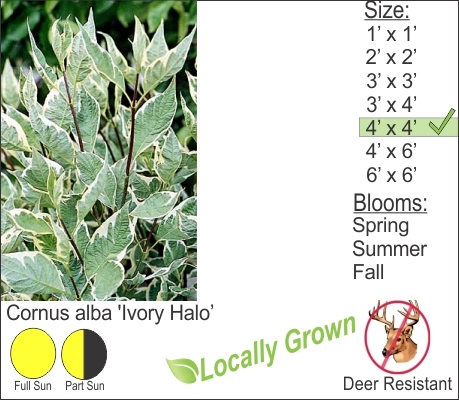 Give this shrubby Ivory Halo Dogwood a little bit of space and allow it to cover large high blank walls along your home. It also looks pretty cool along a property line hedge row in the winter time snow. All of those twiggy blood red stems protrude through the snow banks.